Research group A4Lab deployed a drone of FutureWater’s Mozambican ThirdEye project, to assess the water availability in the dry river beds of the Limpopo river, near the city of Chókwè in Moazambique. The exploration is to deliver more data on the amounts of water in the sandy river beds throughout the dry season with the potential for intensifying irrigated agriculture. The aerial exploration was carried out by the A4Lab Mozambique partners, including local authorities of Quijá District, the NGOs Oxfam Mozambique, ADCR and Kulima, the Institute Superior Politécnica de Gaza – together with Tibor Stigter and Pieter van der Zaag of IHE Delft, The Netherlands. 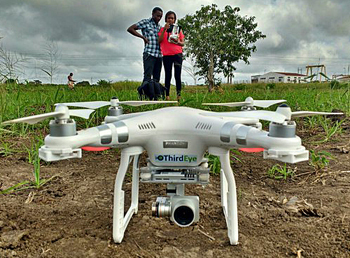 One of the drones operated by ThirdEye for the collection of aerial images and data for some 4,000 small farmers near Xai-Xai and Chókwè, Mozambique. One key to unlocking Sub-Sahara Africa’s agricultural potential is enhancing water security by means of increased capacity to store water. The river beds of seasonal rivers provide such opportunities. 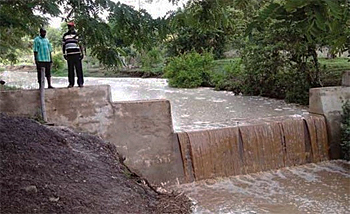 The numerous seasonal rivers and streams in these areas form a natural buffer when water infiltrates in alluvial river channels and adjacent river banks during the rainy season. Communities use the water during the dry season by scoop holes, hand pumps, dug wells or other simple abstraction means. These aquifers have a distributed storage potential that is currently under-utilised. Water storage in these rivers is mostly unmanaged. Many African rivers run dry but there is a big potential to store more water by building small masonry (sand) dams. As these alluvial aquifers are not yet recognized as an opportunity for local farming, the research programme Arid African Alluvial Aquifers Labs Securing Water for Development (A4 Labs) was launched last year. The programme aims to develop new methods for farmers to use water underlying dry river beds and use shallow groundwater more efficiently and sustainable. Three experimental sites – living labs – have been established for smallholder farmers, practitioners, agricultural extension officers, water engineers, private sector and students, to develop such new methods. One of the research topics is to better understand the functioning of the hydrological system. For a sustainable use it is essential to measure water levels and rainfall on a continuous basis. The field labs have initiated to collection of such data that will be sent through a telemetric system, so that it can be showed live online.